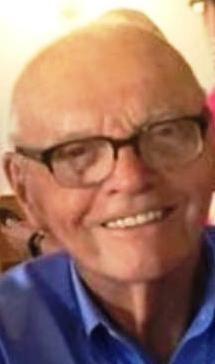 Donald Phillip Hovey of Rowley passed peacefully with his family by his side on Tueday, May 1, 2018. He was born in Ipswich, MA, to George and Blanche (Decker) Hovey on January 1, 1929. He attended Ipswich schools, graduated in 1949 and attended Burdett College in Lynn, MA. He joined the 26th Division of the Massachusetts National Guard and became a Master Sergeant with the 102nd Field Artillery Battalion. In 1953 he married Ruth Amber Knowles. They lived in Ipswich for a few years and moved to Rowley to raise their family of three daughters. Don worked for the First National Stores, the Nissen Baking Company for 32 years and then for the First National Bank of Ipswich for 8 years. He was a part-time Rowley Police Officer and a Rowley Little League coach. Don has been an active member of the Ipswich Methodist Church, the Rowley Baptist Church, the Linebrook Baptist Church, and the Byfield Parish Church. He has been a member of the John T. Heard Lodge, A.F. & A.M. Masons of Ipswich since 1953. Don is survived by his loving wife Amber and his children Pamela Head, Patricia Arsenault, and Heidi Ferrick and their families. He leaves 8 grandchildren; Lisa Attarian, Brian and Jeffrey Head, Melinda Snow and Jason Busfield, Morgan Villanueva, Tyler Ferrick, and Chloe Chaimovich, and 8 great grandchildren;Jamie and Joey Attarian, Noah, Nathan and Natalie Head, Rachel Head, Allison Snow, and Myah Busfield. He is survived by his brother Jere Hovey of Newburyport. He was predeceased by his brother George Hovey of Ipswich and a sister Ruth Hamilton of Minnesota. Don was the keeper of the Bradford Street gaggle of geese. Calling hours will be held on Saturday, May 5, 2018 beginning at 9:00 a.m., at the F. S. Roberts & Son Funeral Home, 14 Independent Street, Rowley. Funeral Service to follow at 10:30 a.m. Burial will be in Main Street Cemetery, Rowley. In lieu of flowers, donations may be sent to the Rowley Council of Aging, 39 Central Street, Rowley, MA 01969, in his memory.